August Cooking Club was at my house this month. Yay! Since I have 7 varieties of hot peppers growing in my garden I needed an excuse to showcase some of them. The theme: Fire & Ice! Everyone had to make something that was Fire-y and Icy – either literally or figuratively. The dishes were a mixture of all: some served hot, some spicy, some cold, some room temp but cooled off the spiciness, and one that was “iced.” It was a blast! I made a Spicy Pulled Pork with a Chilly Jicama Slaw. 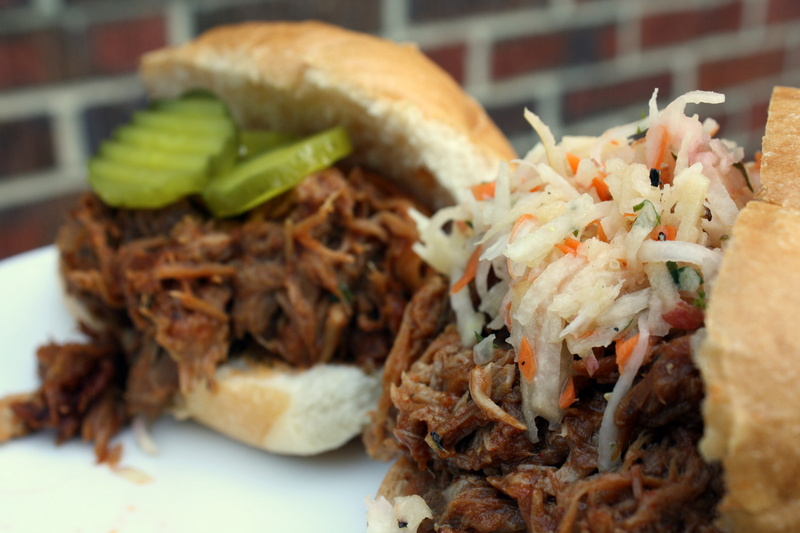 The pork was hot and hot and the slaw was cooling and chilly. J I also made a Fire & Ice Cake: chocolate cake layered with Scorpion Vanilla Ice Cream and orange sherbet. Last but not least, we needed a theme-appropriate cocktail: fresh watermelon margaritas with jalapeno-lime sorbet floaters. The pulled pork recipe details are here. The other recipes will be posted shortly – gotta keep it organized! Start by brining the pork to give it extra flavor. Dissolve 1 cup of salt, ½ cup of sugar and 4 tablespoons of liquid smoke in the quart of apple cider plus 3 quarts of cold water in a container large enough to hold the water plus the pork shoulder. 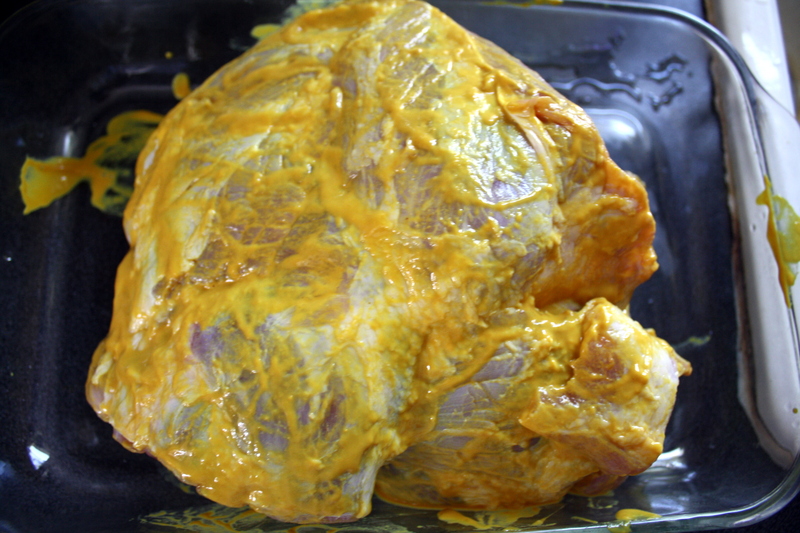 Make one or two large cuts into the thickest portion of the meat to allow more surface area for the brine to work on. Submerge the pork in the brine, cover with plastic wrap or lid, and refrigerate it for 2 hours up to overnight. After the pork is finished brining, remove it from the brining liquid, and pat dry with paper towels; set aside. Combine the mustard and 1 tablespoon of liquid smoke in a small bowl to make the wet rub; set aside. 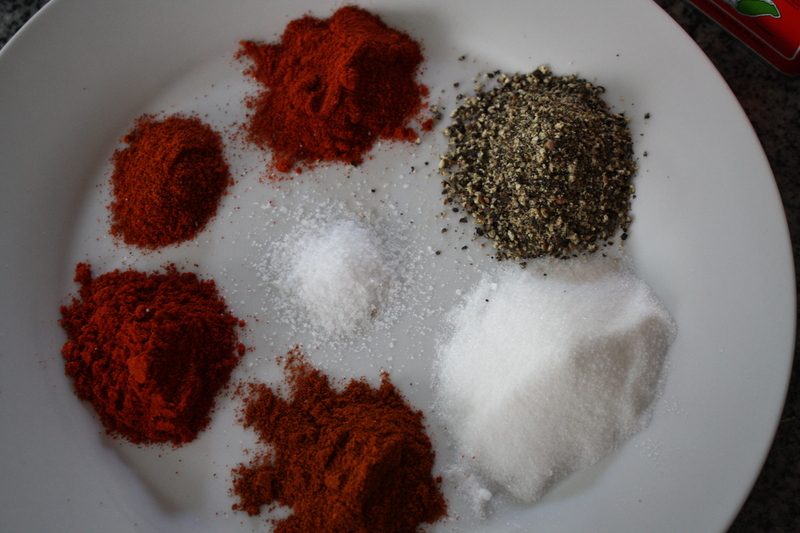 Combine the black pepper, 3 kinds of paprika, 2 tbl sugar, 2 tsp salt, and the cayenne to make the dry rub; set aside. Rub the wet rub all over the pork shoulder, being careful to get inside the slits you made before brining. Next, sprinkle every available spec of pork with the dry rub. You should use all of the both the wet and dry rub. Place the all-dressed-up pork shoulder with half a can of beer into a large crock pot on high for 6 hours. Reserve the rest of the can of beer to add if the crock pot bottom gets dry (it probably won’t). You’ll know the pork is done when you stick a fork into the meat and it easily flakes apart. The bone will slip right out also. Carefully, remove the pork from the crock pot to a large dish (I use a 9” X 13” pan) for shredding. Pour the liquid from the crock pot into a fat separator and reserve for the BBQ sauce. Using two forks, pull the pork apart into bite-size pieces and put back into the crock pot. Make the sauce: Combine all sauce ingredients plus ½ cup reserved pork liquid in a small saucepan. Heat over medium heat until slightly thickened and bubbly. Pour over the pulled pork in the crock pot, turn to keep warm, and start digging in. 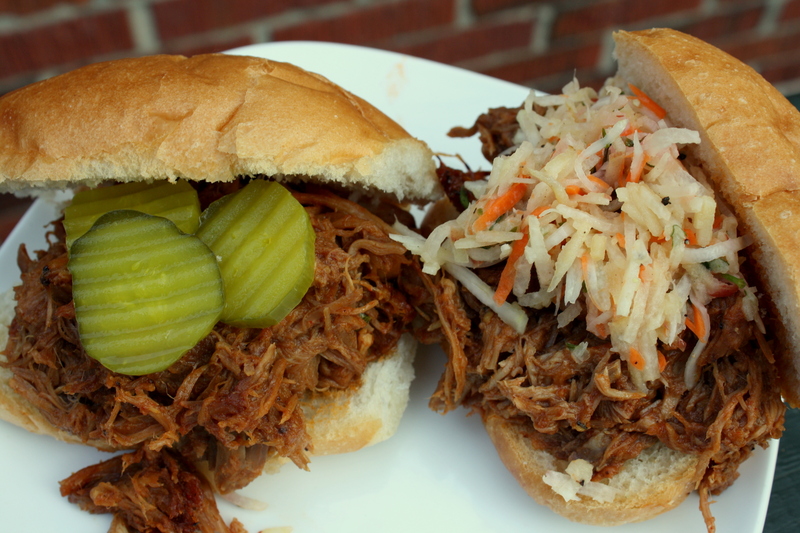 Serve on your favorite kind of roll with some pickles or my Chilly Jicama Slaw. Even Tom – the slaw hater – liked this slaw on his sandwich! In a large bowl, whisk together the apple cider vinegar, lime juice, olive oil, yogurt, sugar, salt, and pepper. Taste and adjust the seasonings as needed (more sugar, salt, or pepper). Add in all the shredded vegetables and toss to coat. Let the slaw sit in the fridge for at least 30 minutes to let the flavors meld together. 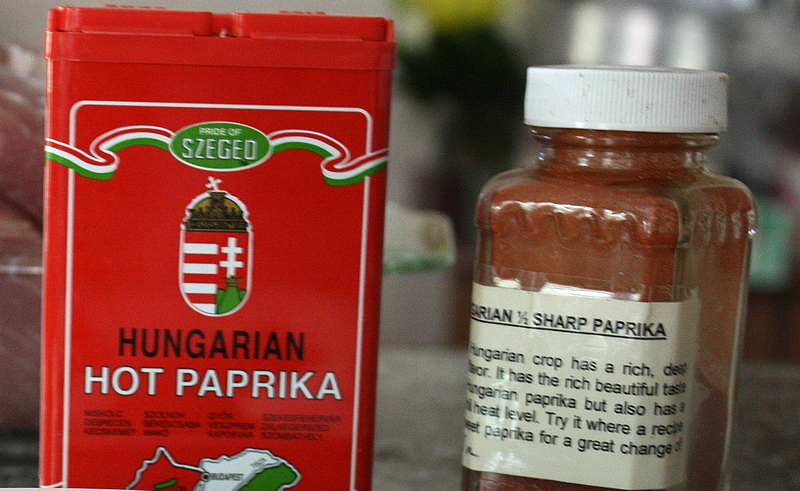 *Hungarian Half-Sharp Paprika is described as a “spicier, hotter version of Hungarian sweet paprika” by The Spice House and can be found at their site. If you don’t have it you can just leave it out completely. I order mine from The Spice House in Chicago. You can check them out here. *Smoked Paprika is smoked sweet paprika can be found online or in the spice aisle of better grocery stores like Wegmans. 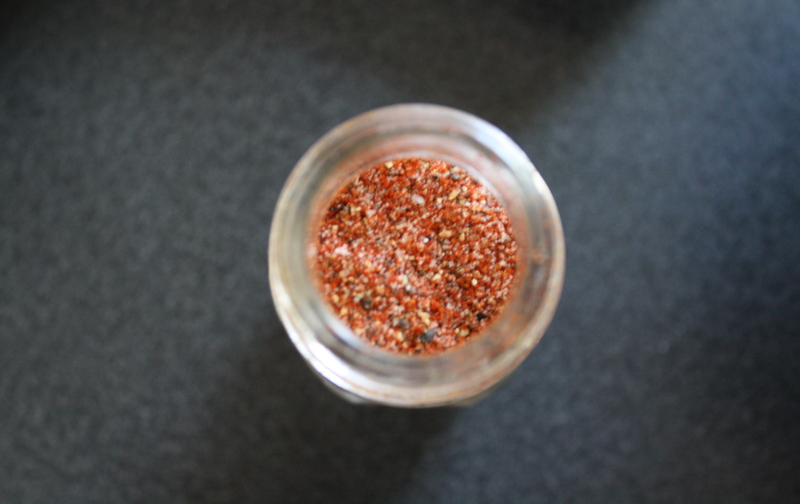 You can substitute regular sweet paprika and add a dash more liquid smoke if you’d like. *Hungarian Hot Paprika is a spicy version of paprika; I found it in Wegman’s in the spice aisle. If you can’t find it, substitute sweet paprika and add twice the cayenne called for if you want your pork spicy. Otherwise, just sub for sweet paprika without doubling the cayenne. 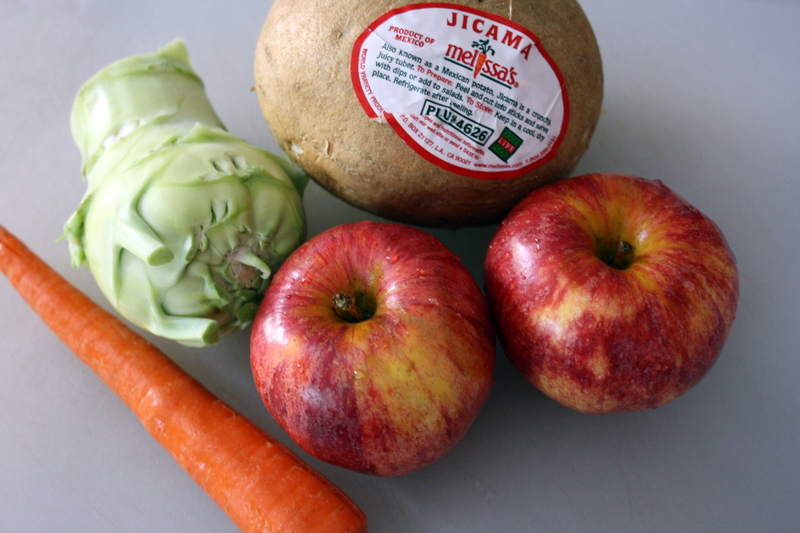 Jicama is a root vegetable popular in Mexican cuisine sometimes called the “Mexican Potato” or “Mexican Turnip.” It’s crunchy and slightly sweet that can be eaten raw or cooked. When you cook it, it stays kinda crunchy. Try it raw on salad or cooked in soup – refreshing either way. Kohlrabi is a mild and sweet relative of cabbage that tastes a little like broccoli stem. It’s crunchy and a nice alternative to traditional cabbage in slaw. 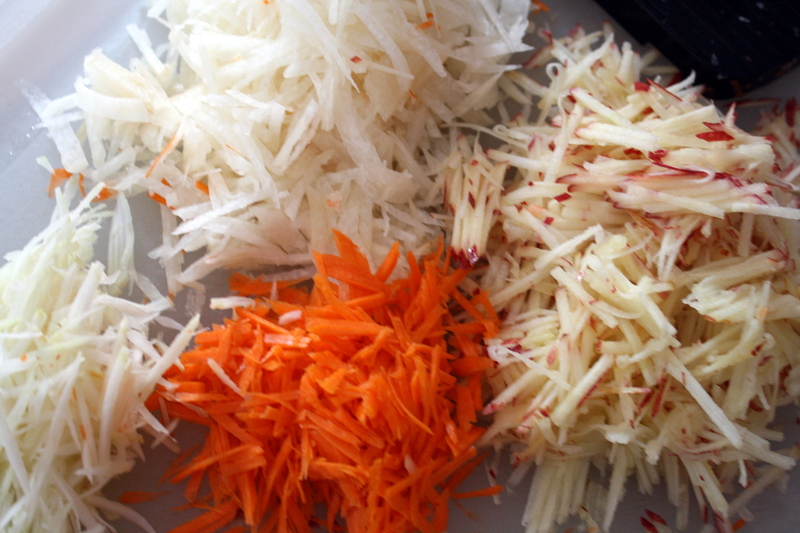 The “cole” in cole slaw actually refers to “kohl” which is German for cabbage. Broccoli, cauliflower, and Brussel sprouts are all in the kohl veggie family. I had some kohlrabi growing outside so I decided to throw it in. If you can’t find it, either leave it out or add in some shredded cabbage. When you do find it, try it out – I’ve put it in soup, sautés, and salad. This entry was posted in Cooking Club, crock pot, main course, Party Ideas, pork, side dish, spicy and tagged barbecue sauce, BBQ, crock pot, Fire & Ice, Hungarian paprika, jicama, kohlrabi, liquid smoke, pork, pulled pork, sandwich, slaw, smokey, spicy. Bookmark the permalink. I love reading your blog! This recipe looks especially good. I have a crock pot — perhaps pulled pork will be its maiden meal. Thanks Liz! I think your crock pot will approve. If you’re just making it for you and Ry, see if you can find a 3lb or so shoulder (they’re harder to find smaller than that). You’ll definitely have leftovers but not an insane amount. Make the same amount of dry rub and save the extra. I sprinkle it into sauteed veggies, tacos, chicken breasts, you name it!